Nearly 200 million people, or 60.5% of the US population, will use a social network at least once a month this year, up 2.6% over 2017. User growth will remain low throughout the forecast period. However, shifts in devices and—more importantly—social platforms used will be increasingly noticeable. Facebook has easily maintained its place as the leading social platform, reaching 60.6% of internet users. But cracks are beginning to show because of the ongoing decline of teen Facebook users. By 2022, its share will slip to 60.2%. The number of Facebook users will rise 0.9% to 169.5 million in 2018, driven by adoption among older age groups. However, there will be declines between 5.6% and 9.3% among users under 25, for a loss of 2.1 million. The biggest beneficiary of this outcome will be Snapchat. By the end of this year, 68.0% of internet users ages 12 to 17 will use the platform. Penetration in this age group will outstrip that of Facebook and Instagram (47.2% and 43.6%, respectively). Meanwhile, Instagram’s user base will increase 13.1% to 104.7 million. Those 35 and older who are creating profiles and connecting with (likely younger) family members less active on Facebook are primarily responsible for this growth. These insights are drawn from eMarketer's latest report, "US Social Network Users: eMarketer's Estimates for 2018-2022." 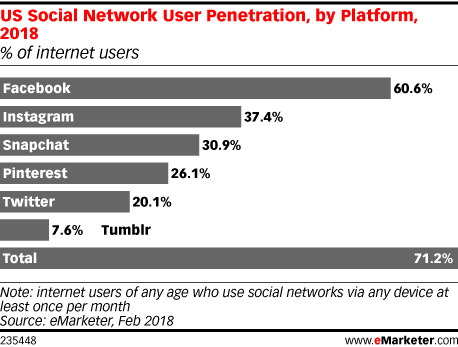 This report includes eMarketer’s forecast for US social network users, mobile messaging app users and social platform users, including Facebook, Instagram, Pinterest, Snapchat, Tumblr and Twitter on each device. eMarketer PRO subscribers can access the full report here.